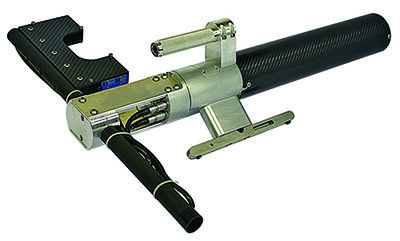 PEMS – Pipe End Laser Measurement System | Bevel Tech Group, Inc.
PEMS, a pipe end laser measurement system, was developed by Bevel Tech Group, Inc as an alternative to traditional caliper measurements for pipe ends. 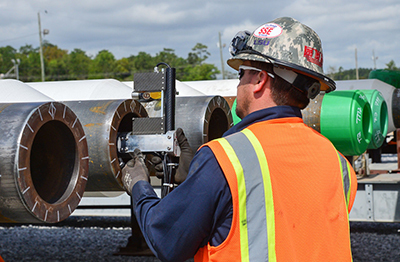 PEMS utilizes its laser tool and software system to accurately and efficiently measure deep water pipe ends. 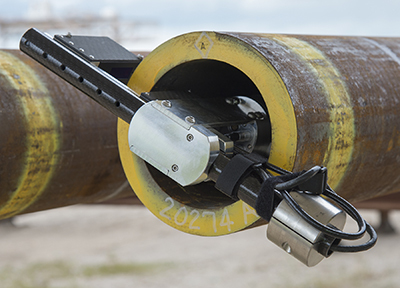 This system simultaneously measures both the internal and external pipe diameter, and produces an accurate wall thickness and eccentricity. The PEMS software allows for easy and precise use of the PEMS tool. The software calibrates, compensates for temperature, stores the measurements, and also allows end matching and pipe grouping to be performed. The software handles all the major calculations needed and can also allow two tools to run simultaneously to increase the number of pipe ends measured in one shift.